The best way to teach a child financial responsibility is by encouraging him to earn and manage his own money. As the weather warms and summer nears, there are many ways for your kids to pull in extra cash. In honor of Youth Savings Month, let’s take a look at nine easy ways for kids to make money. 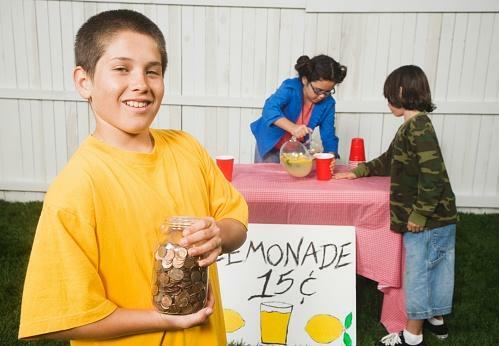 It may be old-fashioned, but selling America’s favorite hot-weather drink is one of the easy ways to make money for kids. For optimal exposure, let your child set up near a local yard sale or another neighborhood event. Your pre-teen can be a huge help to a local senior while earning money on the side. Let your child run some errands, take out the trash or clean the litter box. Spring-cleaning season is the perfect time to host a yard sale. Let your kid be in charge by having him choose the items to feature, set prices and run it. You’ll want to be available to oversee things, but let him make most decisions on his own. If your child is old enough to handle a gas-powered mower and can be relied upon to trim shrubs and weed gardens, let him offer yard work as a service. Your neighbors will be glad to have the help, and your kid will be out in the sunshine while earning some money on the side. Let your kid walk dogs around the neighborhood and offer to pet-sit. If your child is truly a budding entrepreneur and has the skills, he can set up his own daily dog-walking summer business. Generation Z kids are practically born holding smartphones. Let your child use those skills to help older folks who may not be as tech-savvy. He can offer to organize digital photos, assist with data entry or help set up a Facebook page. If your child is too young to babysit on his own, offer his services assisting a neighborhood mom while she’s at home. Let your child take the kids out to the yard while mom watches from the deck, play with the kids at home while mom does laundry or help them with their homework while mom’s busy in the kitchen. Help your child gather empty bottles, cans, cardboard boxes and newspapers to bring to a recycling plant. You’ll be keeping the planet green while helping your kid make money. Let your child try out his car-washing skills on the family car. Once he’s got the technique down, have him offer car washing services to the neighborhood. Your neighbors will cross another weekend chore off their list and your child will be learning that hard work can pay off. Encourage your child to earn his own money and you’ll be teaching him financial responsibility in the best way possible. Once your kid makes money, open a savings account for him so he also learns the importance of saving money. Open a Lil’ Partners or Teen Partners account by June 30, 2019 and be entered for a chance to win a $1,500 family entertainment giveaway! Visit our website for more details.